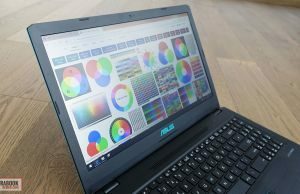 Summary: This VivoBook is a hard sell. On one hand it's rather unique, as it combines a low-power CPU with mid-tier Nvidia dedicated graphics, and it performs well in most situations and doesn't throttle in games. On the other it's just average in terms of build, looks, screen quality and even typing experience, although I find this a good match for my style. Pricing is going to make it or break it though, as Asus also offers an Intel Core U based model with the exact same traits, quirks and kind of GPU, and this one needs to be more affordable in order to compete and overcome the flaws associated with the Ryzen platform. Read on for the whole story. In this article we’re having a look at a rather unique laptop as of August 2018, one that merges an AMD Ryzen APU platform with dedicated Nvidia GTX 1050 graphics: the Asus VivoBook X570ZD (also known as the K570Zd in some regions). 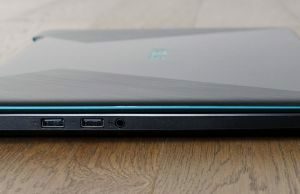 This is the kind of laptop that offers good performance with everyday activities, decent battery life and can tackle more demanding loads and games as well, in a lighter package and with a lower selling point that you’ll get with most other notebook with similar specs, including in most cases those with an equivalent Intel Core U + Nvidia graphics build (which Asus offers in the VivoBook X570UD/K570UD series). 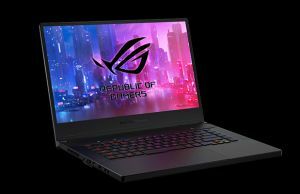 You shouldn’t however consider it unless gaming is one of the main requirements, as otherwise you can find better all-day laptops for less with either Nvidia MX150 graphics or just the Intel UHD options that can still easily handle daily chores. 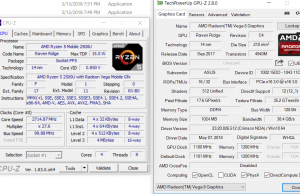 This AMD+Nvidia hardware is however a rather unusual combo, as the integrated Vega graphics is the Ryzen’s platform main selling point over the existing Intel KabyLake-R lines, which is in this case negated by the addition of the dedicated graphics that evens the field in terms of gaming performance. This leaves the Ryzen’s end of a table with little on its side except for a small price-advantage, while the Intel side gets slightly faster performance (even on the i5-8250U) and increased efficiency. 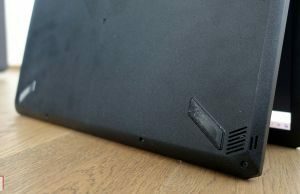 With that in mind, this article takes you through all the bits and quirks of the VivoBook X570ZD / K570ZD series, so you’ll know if it’s something you should consider when shopping for an all-purpose mid-range laptop, or you’d better look elsewhere. Our test unit is an entry level configuration. 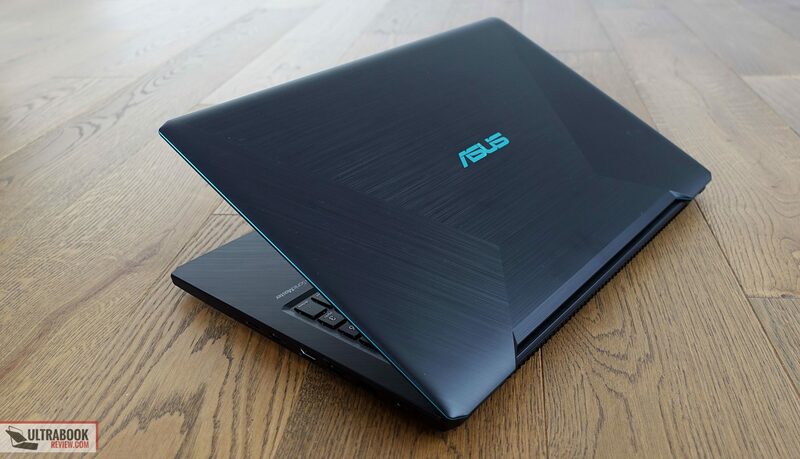 Asus also offers this laptop with an AMD Ryzen 7 2700U APU, the 4 GB version of the GTX 1050 graphics chip, up to 16 GB of RAM and hybrid storage, with a M.2 SSD added alongside the standard 2.5″ HDD, as well as an optional backlit keyboard that this unit lacks. 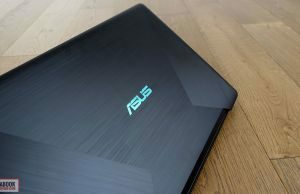 That aside, there’s also a very similar Asus VivoBook X570UD (K570UD in the US) series in their lineup, with the same features and quirks as the X570ZD, but with Intel Core U CPUs and up to Nvidia GTX 1050 graphics. We’ll reference this line throughout the article, as it’s interesting to see how the Intel and AMD configurations stack side by side. 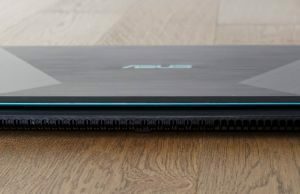 The VivoBook X/K are Asus’s most basic lines of laptops, so it comes to no surprise this unit is entirely made out of plastic and overall just average in terms of build quality. There’s a fair amount of flex in the screen’s frame, the keyboard and the area on top of it, but overall it’s not that bad. Nor are the plastics used for the outer shell, with a textured finish that somewhat mimics brushed metal, which is a little cheesy on one hand, but on the other should handle scratches and everyday hassle fairly well. 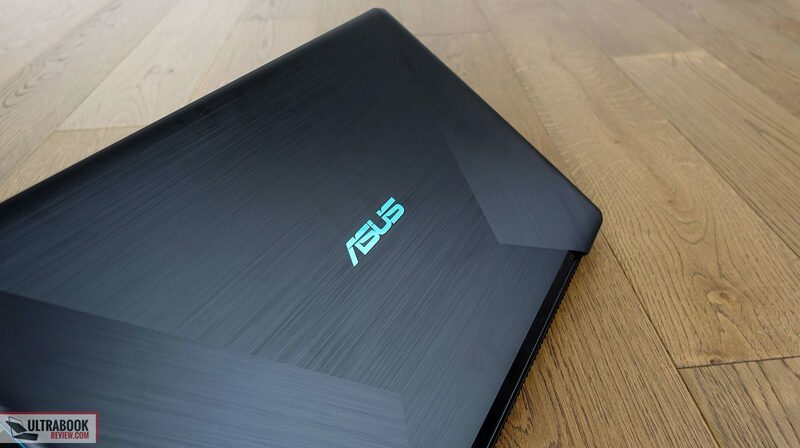 As far as the aesthetics go, this is a commonly looking laptop with dark-gray exterior and interior, and just a tad of blue used for the logos and a thin plastic strip around the display, on the outside. These are subtle accents, but enough to make it somewhat stand out in the crowd. 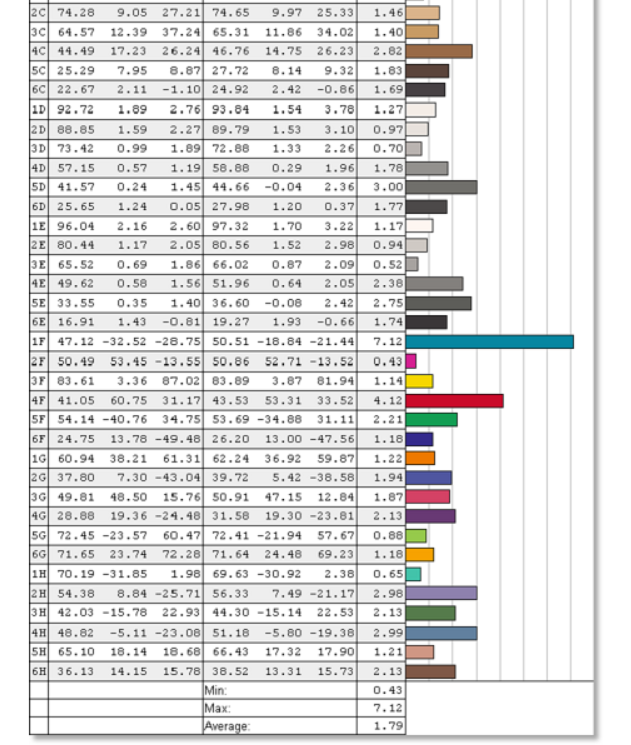 As far as I can tell there are no other color choices though. 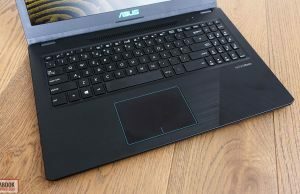 Sticking with an all plastic construction helped Asus keep the weight at bay, with the K570 weighing just a tad under 2 kilos, and they didn’t skim on the battery either, like with the lighter and smaller VivoBook Slim lines. Speaking of size, this laptop is not as compact as some other options out there, but not bulky either, with average sized bezels around the screen and a total height of around 22 mm. 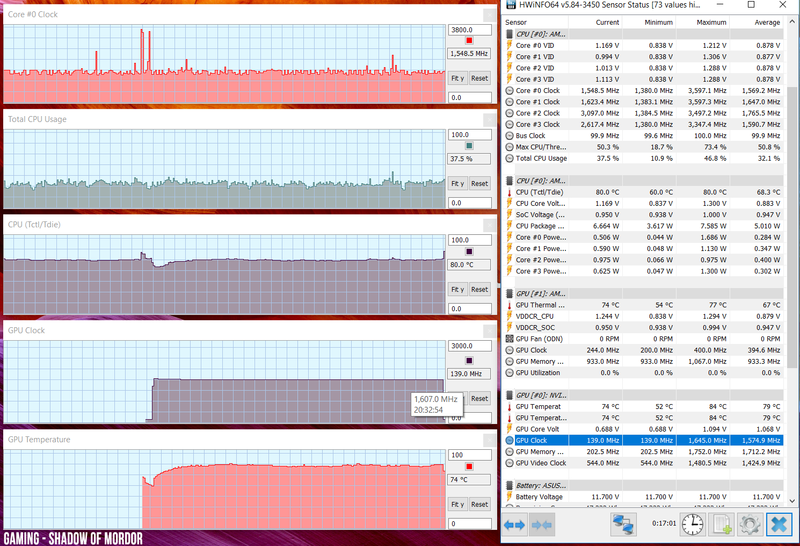 On the more practical side of things, there’s not much to complain about this VivoBook K570ZD. 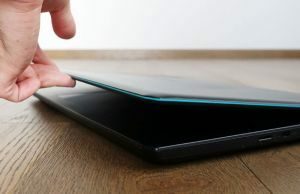 The screen is a little longer than the main body and leaves a small lip for you to grab and lift it up from, which for the most part is a one-handed operation. Two sturdy hinges keep the display attached to the main body and allow it to lean back to about 140 degrees. 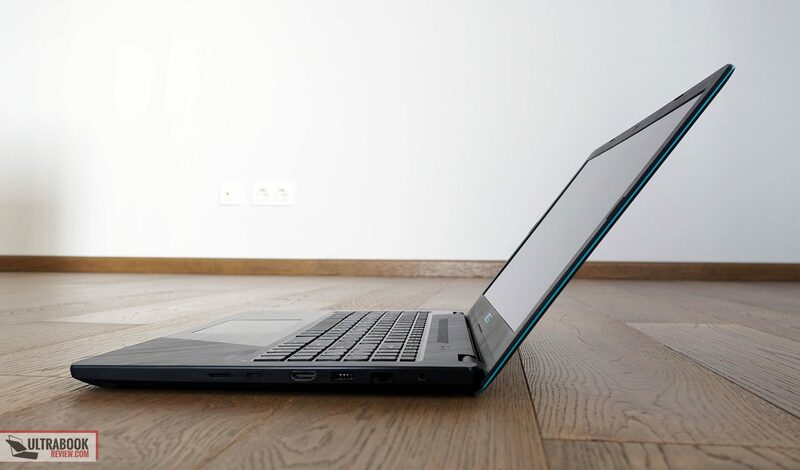 The notebook also sits well on a desk thanks to its grippy rubber feat on the belly, and down here you’ll notice some air intake cuts, as well as two small cuts for the speakers in the lower corners. The entire back edge is also a big air grill, both for intake and for exhaust. The IO is lined on the sides and is fairly basic, but enough to satisfy the regular user, with three USB-A ports, one USB-C, LAN and HDMI 1.4 for video output. There’s no full-size card reader though, just one that can take microSD cards, and most of these connectors are placed on the right side, which can lead to a little bit of clutter if you plan to hook up a mouse. 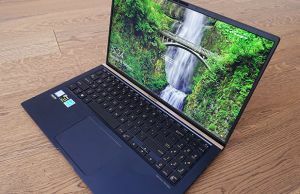 All in all there’s nothing special about the VivoBook X570ZD in terms of build and looks, but nothing deal-breaking either. In terms of constructions, choice of materials, sturdiness, IO and overall practicality it’s pretty much an average entry to low-mid level notebook in 2018. 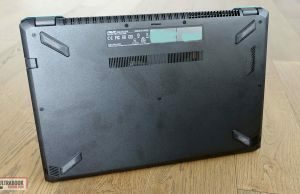 Asus offers this laptop with either a backlit or a non-backlit keyboard, and we got the latter version on this test unit. Both share the same layout, which is mostly standard and fine, except for the fact that the arrows are smaller than the other keys and crammed together with the also shrunk NumPad section. The NumPad lacks a dedicated Enter button, but that’s standard on this kind of laptops. 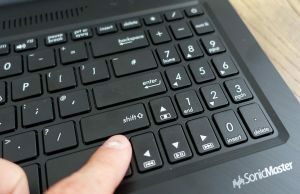 The Power button is integrated as the top-right key, which is again fairly common in this class. 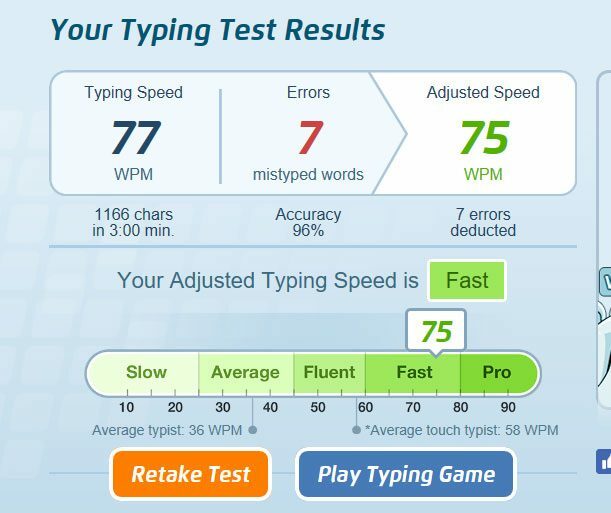 I was however surprised by how well this keyboard types, or at least how well it matched my particular typing style. There’s some flex in the main-chassis, but even so I was able to type fast and accurately, with little accommodation time. 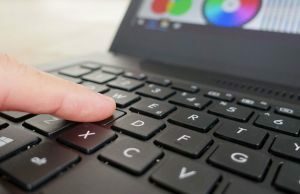 For some reason I even liked this keyboard better than what Asus puts on many of their more premium laptops, which I definitely didn’t expect. 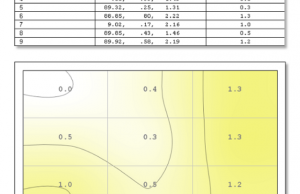 Keep in mind this is a short-travel key, with just a 1.4 mm stroke, which is probably why it fits me so well. The keys have a nice springy feel, but are still a bit spongy, so there’s a chance you might not feel the same about them. 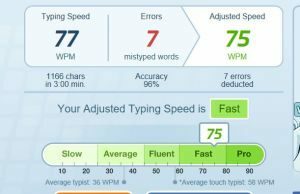 In fact, this review on the VivoBook K570UD critiques the keyboard, so I’d say the experience is highly subjective on what you’re already used to. 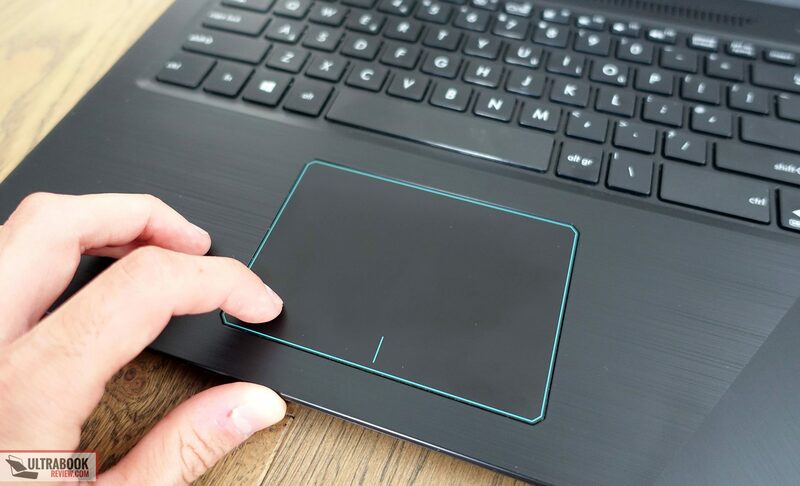 The trackpad is pretty good as well. It’s average in size and made out of plastic, but gets Precision drivers and overall handles taps, gestures and swipes smoothly and accurately. The click surfaces are somewhat stiff and clunky though, but still usable. 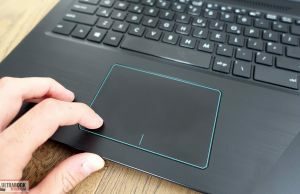 Higher end versions of this laptop also integrate a fingerprint sensor in the top-right corner of the clickpad, but our test model did not. 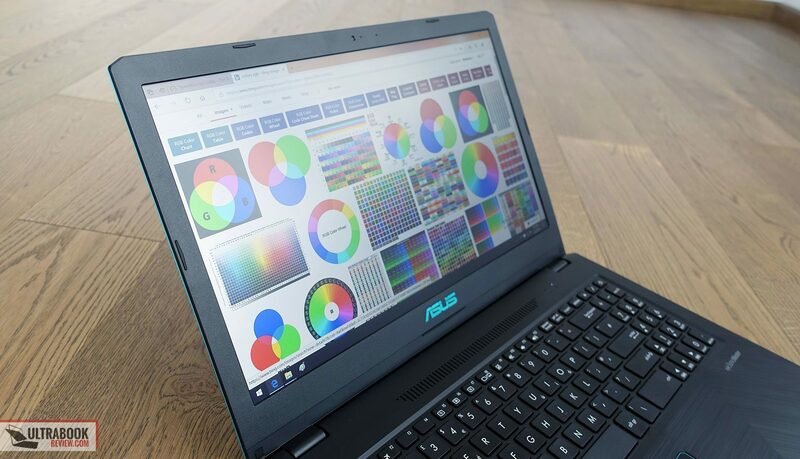 There’s a matte 15.6-inch screen on the VivoBook X570ZD, but Asus offers three panel options, one TN and two IPS models, with 45% and 72% NTSC color coverage, according to the official specs. 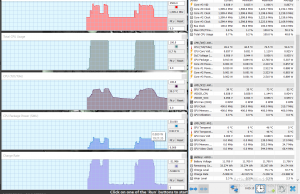 We got the mid-level IPS option on this test unit, and it’s mostly OK for everyday use and multimedia content, as long as you keep the computer indoors or in dimmer environments. Like with most other entry-level IPS screens, this one only gets a maximum brightness of around 220 nits, which makes it unusable in bright light. 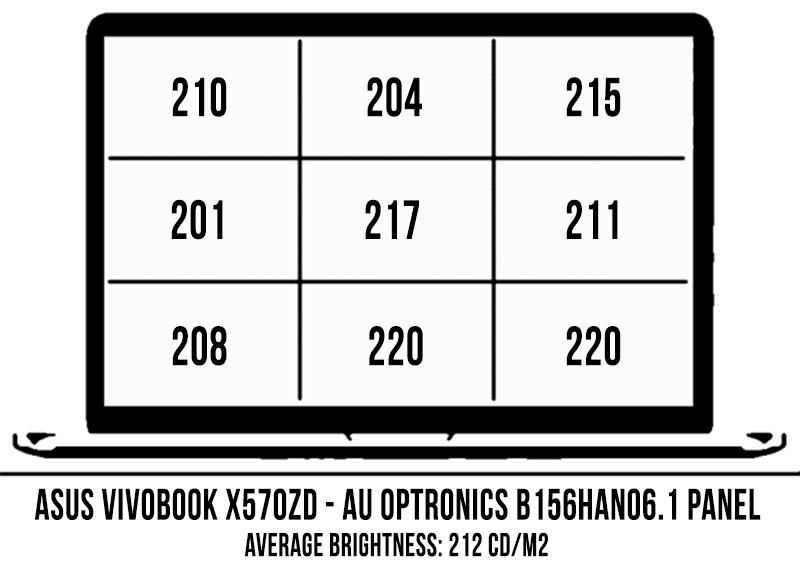 The viewing angles, contrast and uniformity are pretty good though, as you can see below, and PWM is not used for brightness modulation at any level. 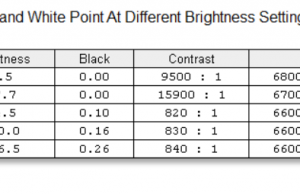 Black on max brightness: 0.26 cd/m2. 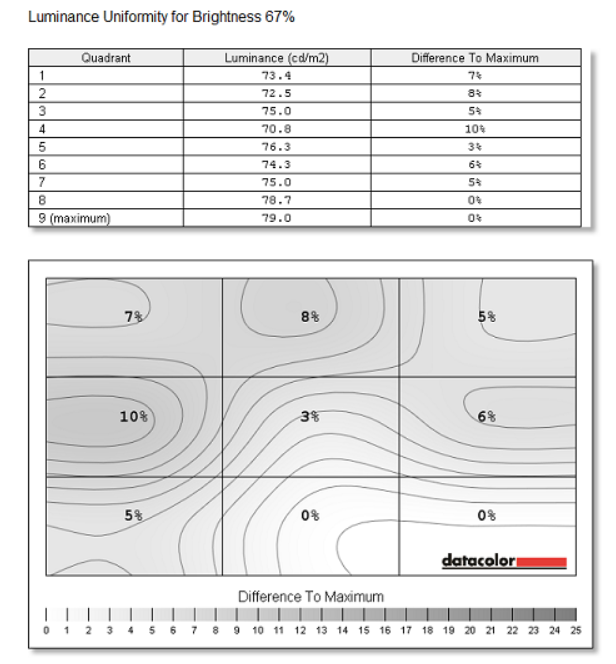 You’ll want to use the calibrated color profile to address the gamma imbalance, even if otherwise this panel offers pretty good colors and gray-levels out of the box. 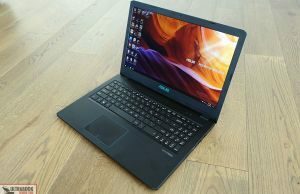 All in all this is a decent mid-level IPS screen, similar to what you can find on many laptops in the $600 to $900 price range, like the Asus VivoBook K570UD, Asus FX503VM or the Acer Aspire 5. 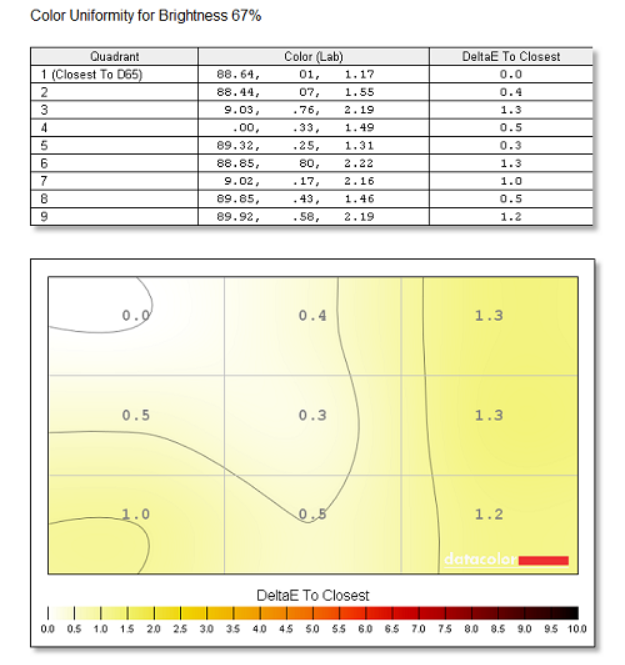 Just don’t expect much in terms of color accuracy and keep it indoors. Ok, let’s get to the elephant in the room. 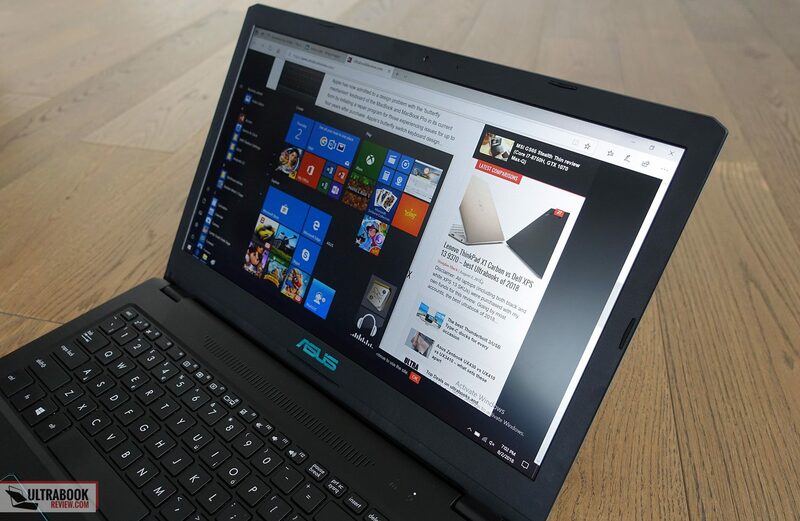 Our configuration of the VivoBook X570ZD is an entry-level model in terms of hardware specs, with the Ryzen 5 2500U APU, dual graphics (Radeon RX Vega 8 + Nvidia GTX 1050 2GB VRAM), 8 GB of DDR4 RAM and only a 5400 rpm HDD for storage. 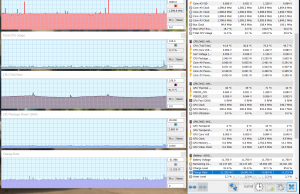 The lack of an SSD greatly cripples the overall experience, especially during the first hours with the laptop, when Windows 10 gets to run all its updates. We also ran into that annoying Windows bug that puts a constant 100% load on the HDD, but we manage to somehow tweak past it. 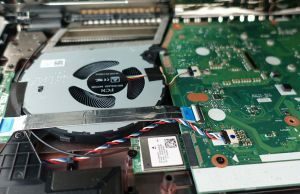 Even so, when you’re used to the performance of modern laptops with PCIe storage, going back to a HDD based computer is a painful experience. Bottom point, buy a configuration with an M.2 SSD (NVMe drives are supported here), or add one yourself. But that’s not as easy as on most other laptops. 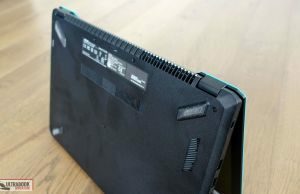 Getting inside this laptop requires to unscrew the entire back panel, that’s simple. The laptop opens from the interior though, as the components and fixed onto the back shell, so that means you need to lift up the keyboard-deck and carefully disconnect the two ribbons that attach it to the main part. That will give you access to the HDD and Wi-Fi chip, but the two RAM sticks and the M.2 SSD slot are placed underneath the motherboard, so you’ll also have to take that one out as well, which is not something I’d recommend to an inexperienced user. It will also void warranty, so it’s simpler to get the SSD and the right amount of RAM from starters. 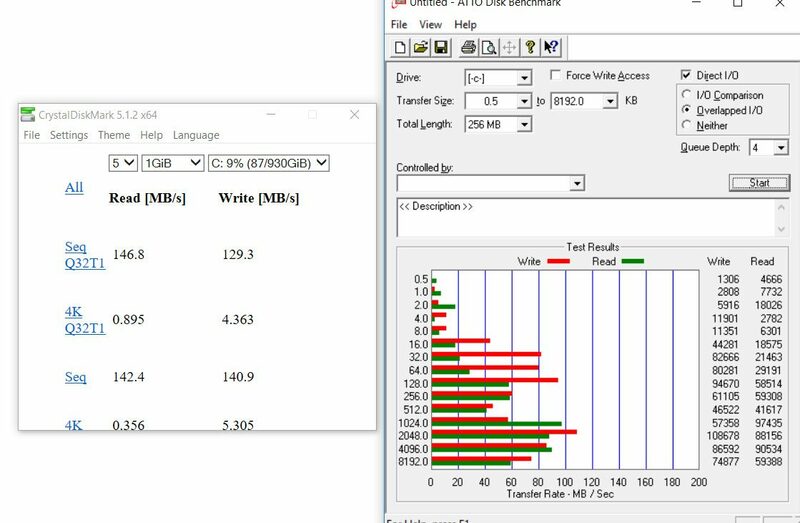 If we look past the nuisance of not having an SSD, the X570ZD handles everyday activities fine, from movies to music, browsing and multitasking. 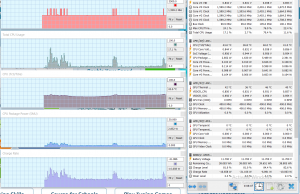 You’ll find more about performance and temperatures in the following logs. Things get a bit trickier when we jump to more demanding loads. 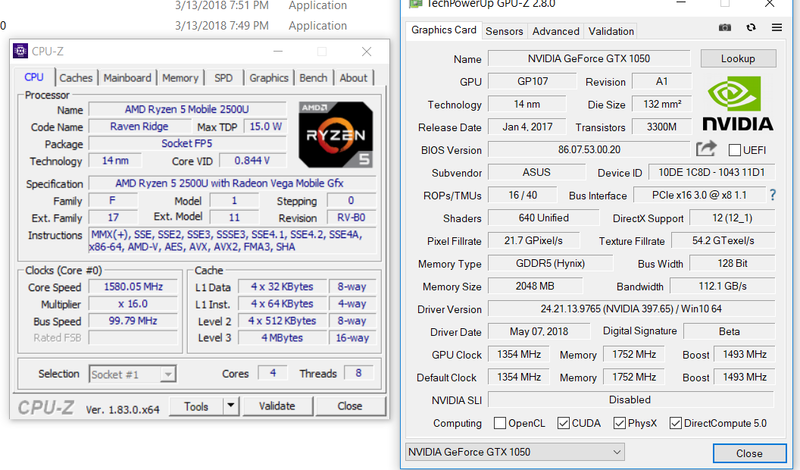 Aside from the standard set of benchmarks, we also run Cinebench R15 in a loop in order to simulate a constant 100% CPU load. 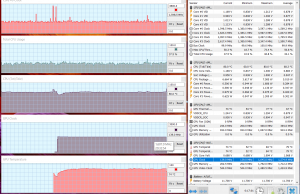 Despite the fact that the CPU stays within comfortable temperature limits, it still clocks down after a few runs, so while we initially got scores of around 600 points in our test, these quickly drop and stabilize at only about 450-470 points. 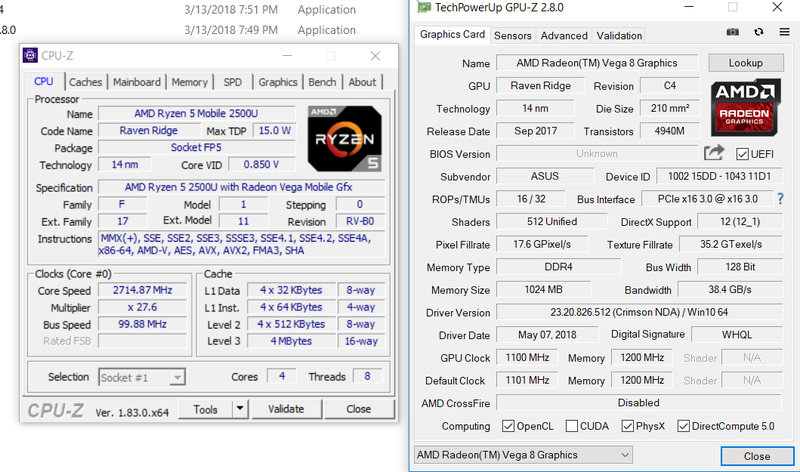 The CPU only averages about 55-60 degrees Celsius and a TDP of under 10 W during all these tests, so I’d expect improved drivers to enhance the computer’s behavior on the final retail units. At the same time we’ve also seen some aggressive thermal limitations on the Acer Swift 3 Ryzen build we’ve tested in the past, so perhaps this is not just a coincidence. I can’t draw any clear conclusions based on this pre-production model though, we’ll have to further look into it in later articles. 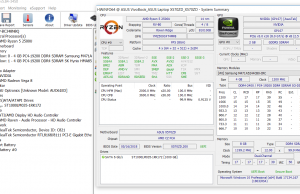 Even so, the Ryzen 5 2500U APU is in most cases on par with the KabyLake Core i5-8250U CPU in terms of performance, so it is an alternative worth considering, while those interested in a slightly beefier configuration can look at the Ryzen 7 2700U APU versions of this notebook, which is a better match for the Core i7-8550U option in Intel’s camp. 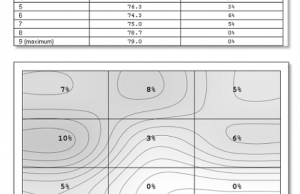 If you’re interested in benchmarks results, here’s what we got on our sample. Keep in mind this is a pre-production unit and only relies on a spinning HDD, which takes its toll in some tests. 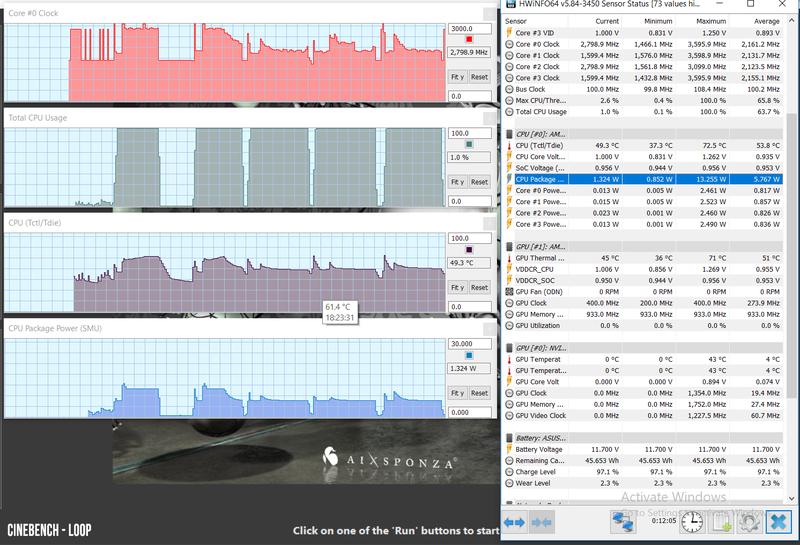 x264 HD Benchmark 4.0 32-bit: Pass 1 – 115.83 fps, Pass 2 – 29.37 fps. As far as gaming goes, our test unit gets the lower-end version of the GTX 1050 graphics chip, with just 2 GB of VRAM, but the hardware performs well and the gaming experience is pretty solid. 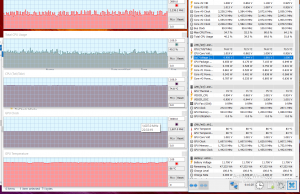 I was afraid the single-fan cooling system might cause throttling with the more intensive titles, but that wasn’t the case at all. 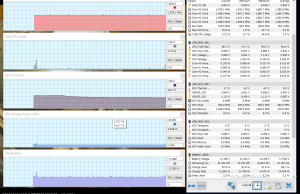 The GPU does however heat-up significantly, running at 80-86 degrees in games, without any performance loss though, as you can see in the following pictures. 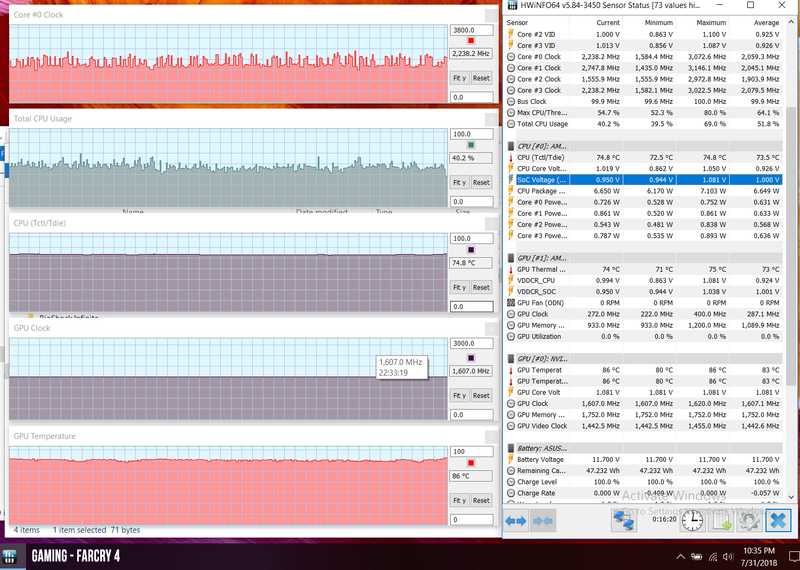 Only a single fan cools both the CPU and GPU on this laptop. 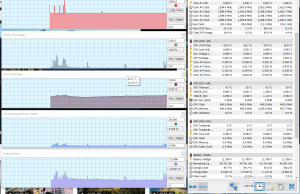 It’s a pretty big fan, helped by system of heat-pipes. I don’t have a picture of this system to show you, as I didn’t remove the motherboard to get to them on this test unit. The fact that this cooling system can keep the CPU and GPU at bay in demanding loads matters most though, especially when it’s corroborated with only average noise levels and outer-shell temperatures. 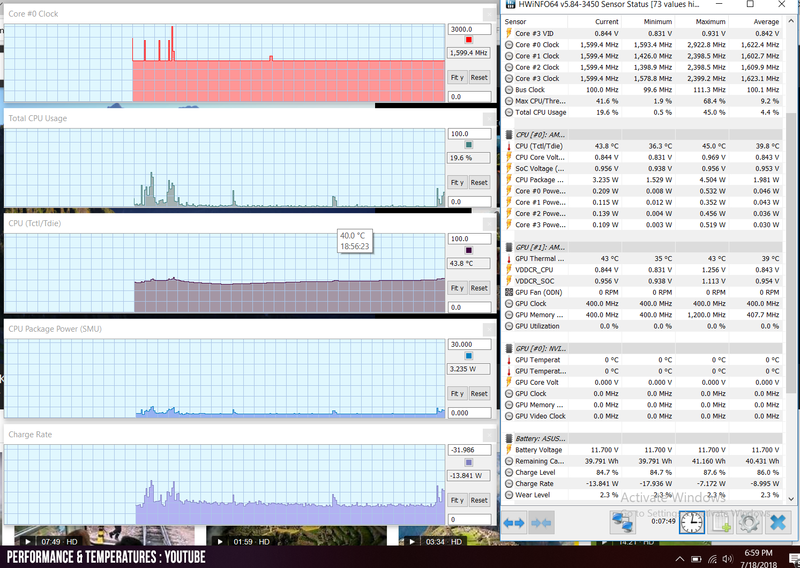 All the intake cuts (on the belly, back side and on top of the keyboard) sure help. On the other hand, a Ryzen 7 build with the 4 GB GTX 1050 GPU might struggle with this kind of cooling, as we already know that the Core i7-8550U + GTX 1050 4GB versions throttle in some cases. 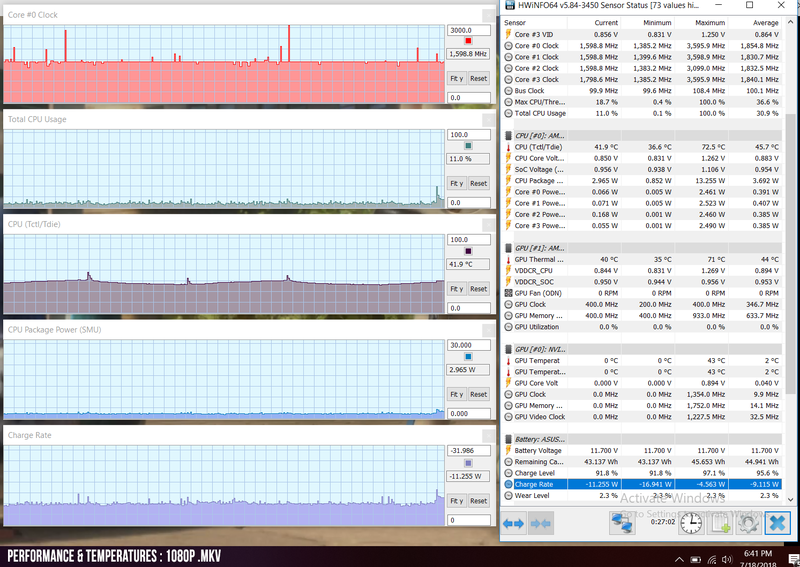 The fan is active all the time, but pretty much inaudible with daily activities and multitasking. 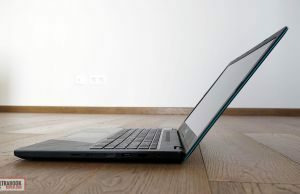 You will however hear the spinning HDD, and if you put your ear close to the keyboard you’ll also notice some electrical grinning, but not at regular use distance. 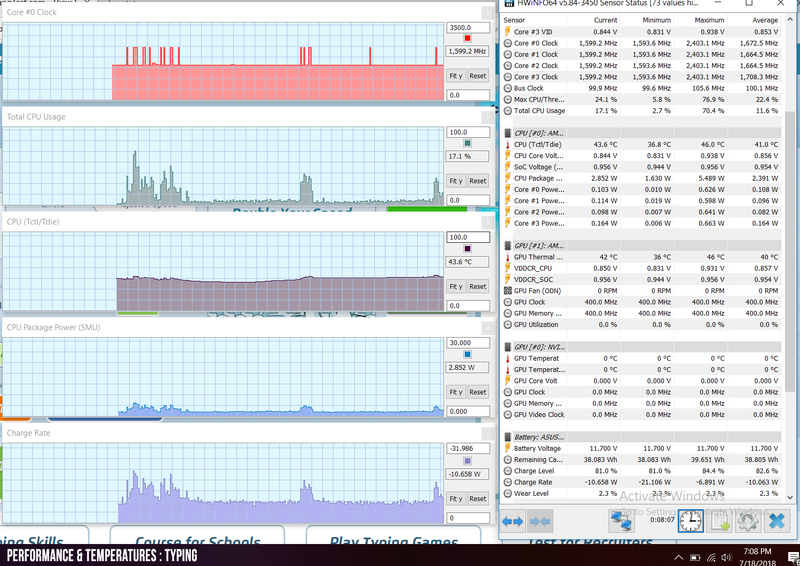 With games it spins faster and ramps up to about 48 dB at head-level, which is still pretty good for gaming laptop. As far as connectivity goes, there’s Wireless AC, Bluetooth and Gigabit Lan on this computer. 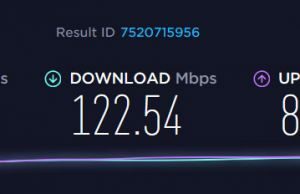 You’re not getting one of those newer generation Wave 2 wi-fi chips, but the wireless performance isn’t bad, both near and farther away from the router. Having seen the tiny cuts for the speakers on the underbelly, I was expecting poor audio on this laptop, but I was pleasantly surprised. The two speakers are not that loud, only getting to a maximum volume of 75-76 dB at head level, but they sound really well for this class, with clear audio, no distortions and even a fair amount of richness. You will however feel vibrations in the palm-rest at volumes above 50%. When we opened the laptop we noticed that the speakers inside are actually quite big and Asus uses rubber gaskets to attach them tot he chassis, but even so the design isn’t able to dampen vibrations as well as on the ROG GL504 for instance, which also uses similar rubber rings. 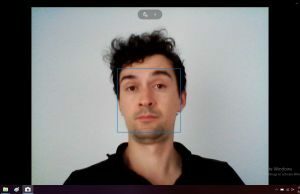 We’ll also mention the webcam in here, but you might as well forget about it, as it’s one of the worst we’ve seen on a laptop in recent years. It’s barely usable in proper light conditions and totally crap otherwise. There’s an averagely sized 48 Wh battery inside the VivoBook X570ZD. 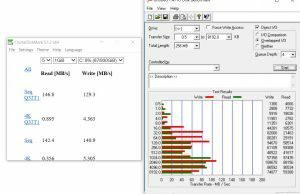 The AMD hardware runs at a higher frequency and higher TDP than Intel’s alternative with basic tasks, and as a result is not as efficient in tasks like watching video, listening to music or editing documents. 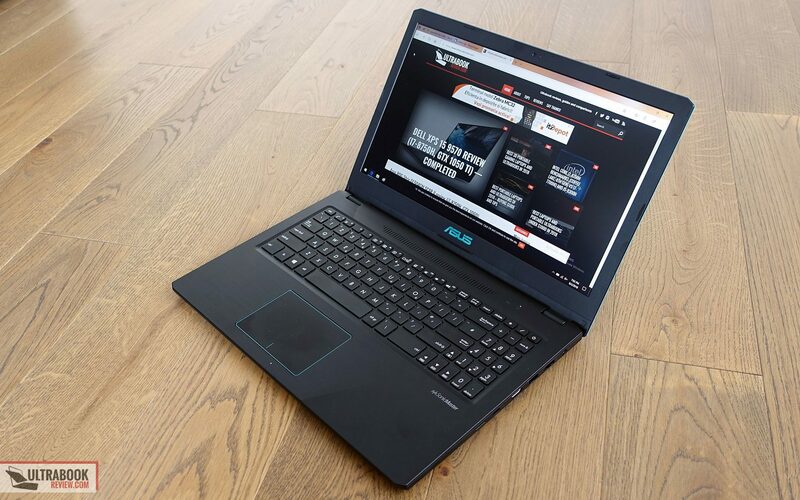 Things even out when it comes to multitasking and browsing, so you’ll still get about 4-5 hours of regular use on this laptop, but also only a little over 5 with video, compared to the 7-8 an Intel based configuration can offer from a 48 Wh battery. 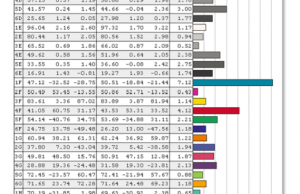 Here’s what to expect, with the screen’s brightness set at around 120 nits (~50 brightness). 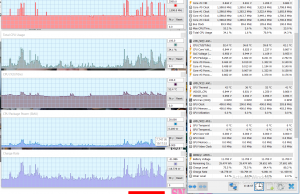 11.5 W (~4 h of use) – heavy browsing in Edge, Better Performance Power Mode, screen at 50%, Wi-Fi ON. Keep in mind our unit came with a spinning HDD, configurations with an SSD should handle basic tasks slightly more efficiently. 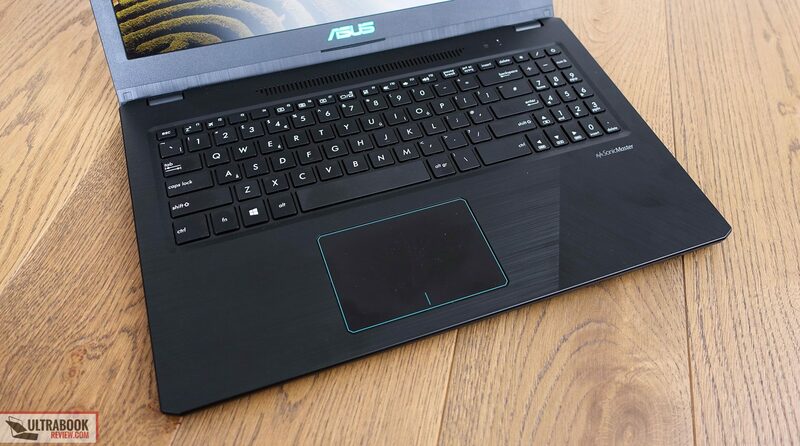 Asus pairs this with a 120 Wh charger with quick-charging. A full-recharge takes around 1 hour and 45 minutes, with 60% of the capacity able to replenish in about 50 minutes. 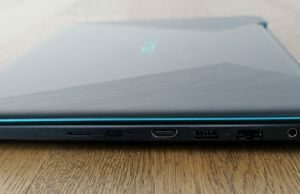 The VivoBook X570ZD is not available in shops at the time of this article. From what we know so far, a mid-range configuration with the IPS screen, AMD Ryzen 5 2500U APU, Nvidia GTX 1050 4 GB graphics, 8 GB of RAM and SHDD storage should go for around 750 EUR in Europe, while the Ryzen 7 2700U models sell for about 100 EUR extra. I’d actually expect these to go for less in the US, as the Core i5-8250U / GTX 1050 configuration of the VivoBook K570UD is already available over there for a little under $700 at the time of this post (more details via this link), and generally Ryzen 5 builds are cheaper than equivalent Core U versions. We’ll update this section once we know more. 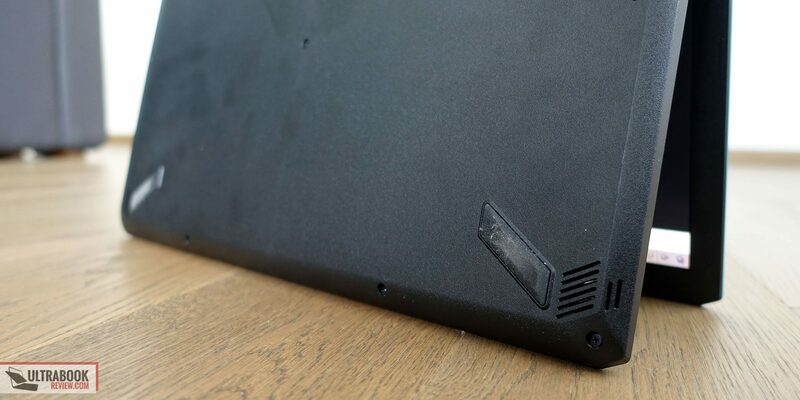 When we draw the line, this laptop is a hard sell. Pricing is going to make it or break it, as in my opinion it needs to be at least $50-$100 cheaper than the Intel + Nvidia models in order to compete, which I’m not that sure will happen. 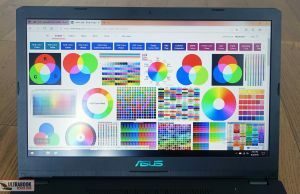 Normally, you’d want an AMD Ryzen notebook for the extra performance offered by the integrated GPU, compared to a similar configuration with an Intel Core U processor and Intel UHD 620 graphics, even if that comes with poorer efficiency with everyday activities and especially with video content. 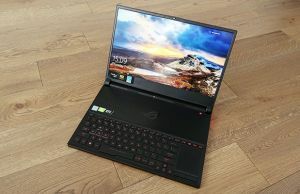 In this case however, the potential advantage of the Vega graphics is negated by the addition of the GTX 1050 graphics, so you’re getting a computer that’s on par with an Intel based alternative in games, yet a little bit slower with demanding CPU loads and not able to last as long on a charge with movies and other basic-level tasks. Hence, the need for a lower price compared to the VivoBook X570UD/K570UD alternative with Intel Core U + GTX 1050 hardware. On the other hand, I’m reading about significant CPU throttling on the Intel Core i7 versions, while this AMD Ryzen only struggled in demanding CPU loads and not in games, so that could be an ace down for the AMD versions. You should further look into this matter. 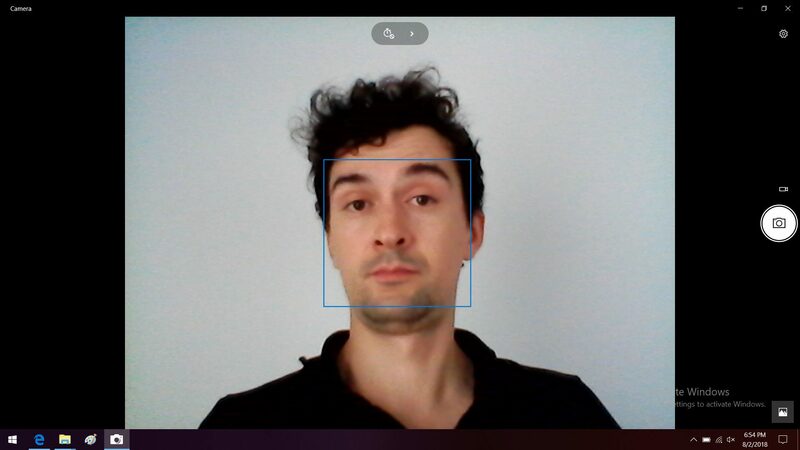 That aside, this VivoBook is average in terms of construction, looks or screen quality. 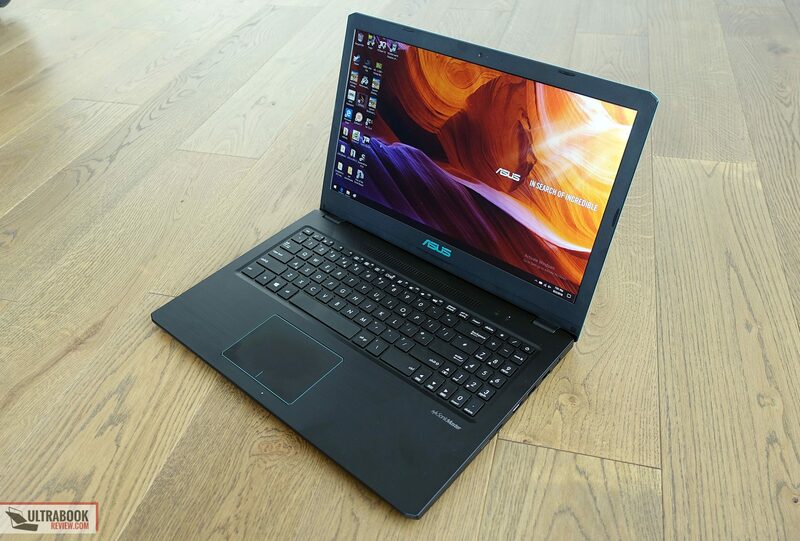 It does perform well with daily chores and games, but not that well with CPU intensive tasks. I was however surprised by how well it types, although its low-travel keyboard might not be for everyone, and also surprised by its rich sounding speakers, for the class, of course. 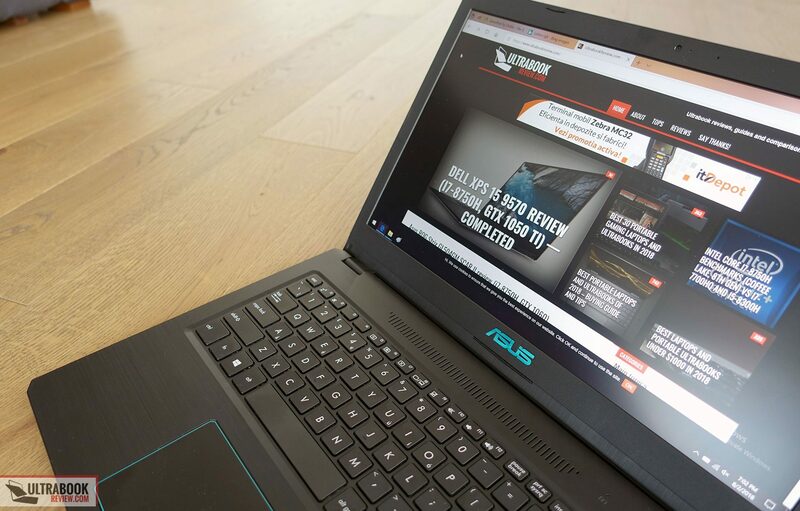 At the end of the day though, this Asus VivoBook X570ZD series, alongside the Intel based X570UD/K570UD, doesn’t get much direct competition out there, as most gaming laptops with GTX 1050 graphics are more expensive and are based on more powerful, but also more power-hungry Coffee Lake Intel Core H CPUs, while most Ryzen 5 and Core U notebooks don’t get the same kind of graphics power. 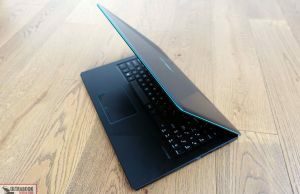 The 15-inch Acer Spin 5 is an alternative to consider, but overall those of you interested in a well balanced all rounder that can tackle everyday activities and games in a more compact and more affordable envelope might just find the sweet spot with these lines. 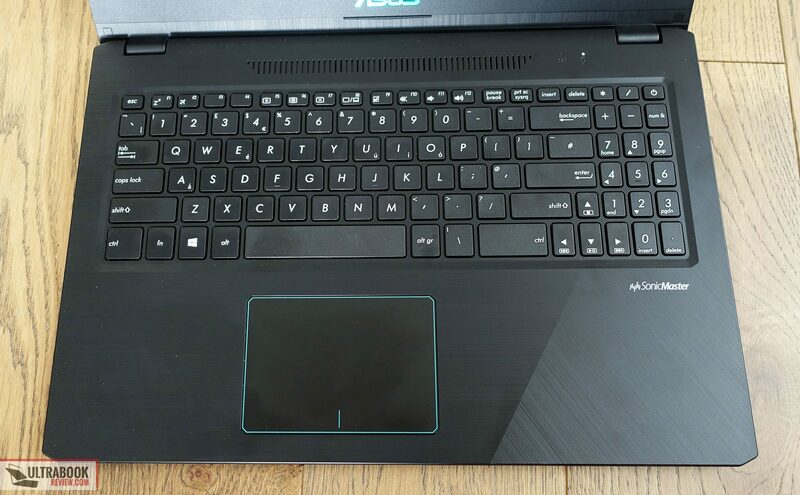 So I am considering purchasing this laptop for video/photo editing purposes, and I was curious if it would be good for that? 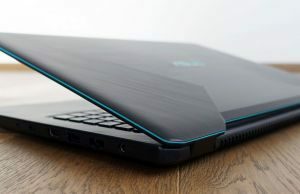 I'm also considering the Vivobook S15UN-MS52 for the same purposes, but I was thinking that might not be as good since the GPU isn't as good as the K570. 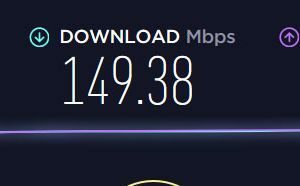 I would be buying the version with the core i5 8250u, and do you know if throttling is a problem for what I'd be doing? 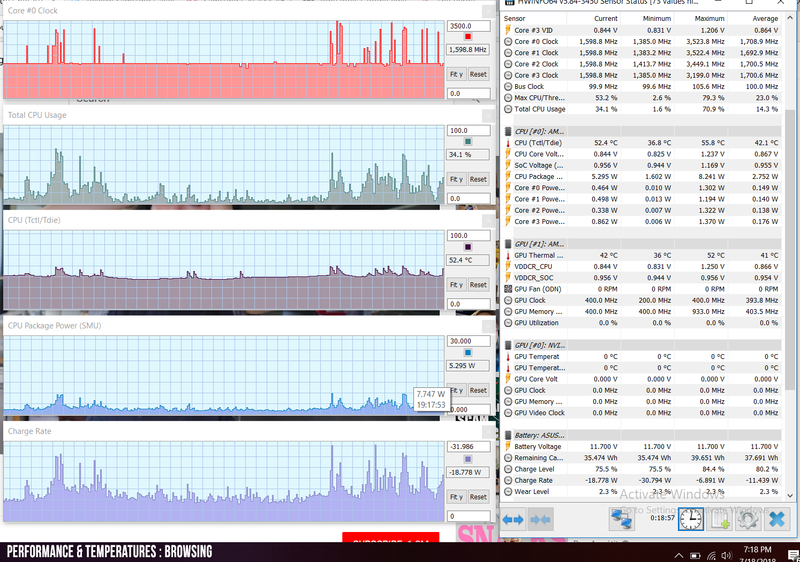 I would be editing only 1080p video, so 4k isn't something that I'm interested in right now. I really hope either of these laptops will be good for me, but I'd rather not buy if they aren't going to work for me. Thanks so much! 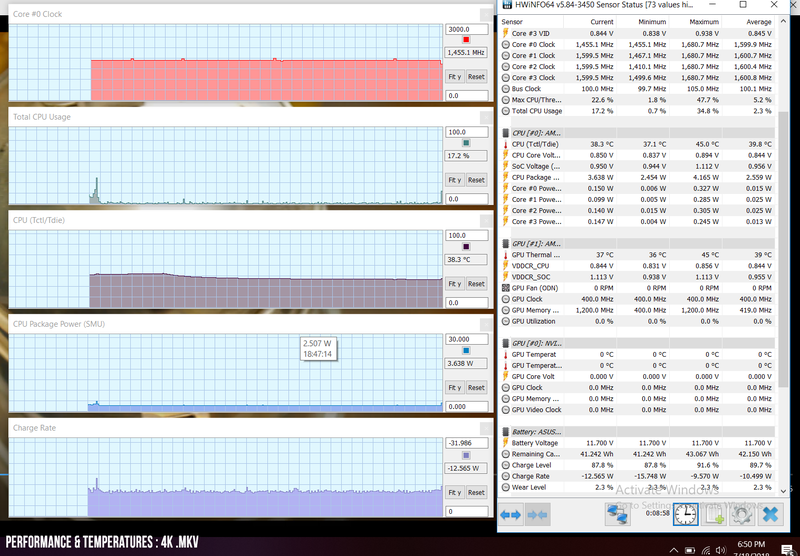 You should make sure that the software you're going to use actually uses the GPU to accelerate rendering. Even if it does, I think a Core U i7, 16 GB of RAM and lower end graphics would better match your requirements, or even better a Core i5-8300H configuration of possible. Was close to buying this before reading this review. 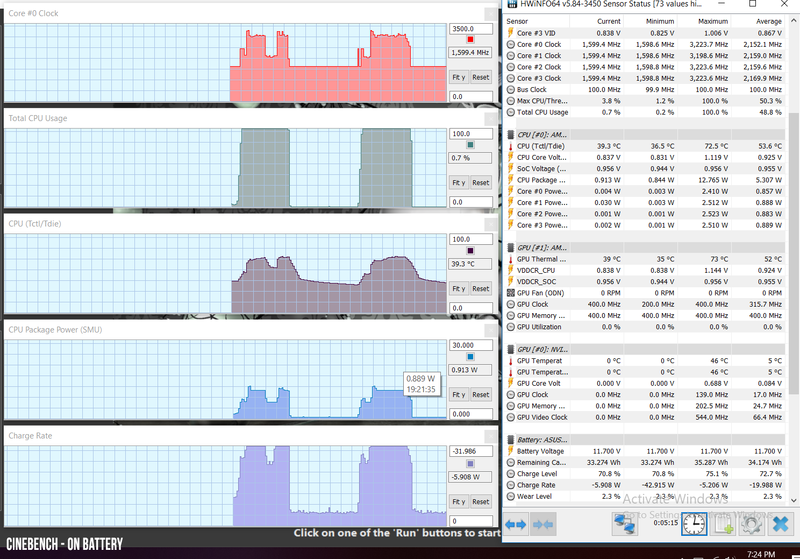 Plan was to upgrade RAM, but not when it's built like that. Was planning to buy this laptop too until I saw that accessing the upgradeable components is a chore. 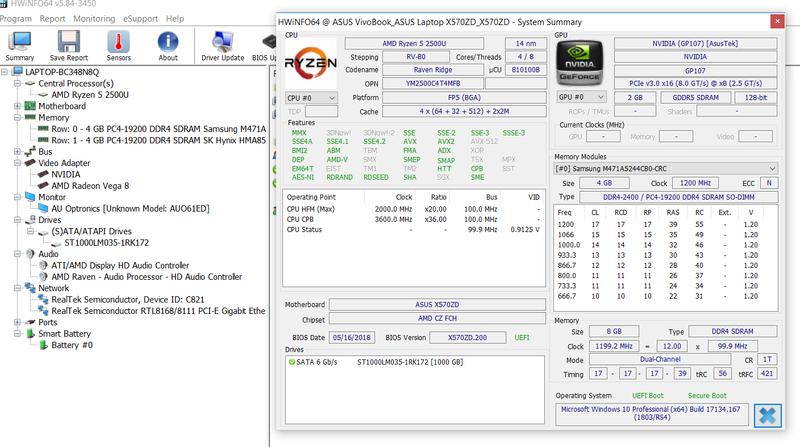 Another laptop with good specs that is ruined by bad internal layout. 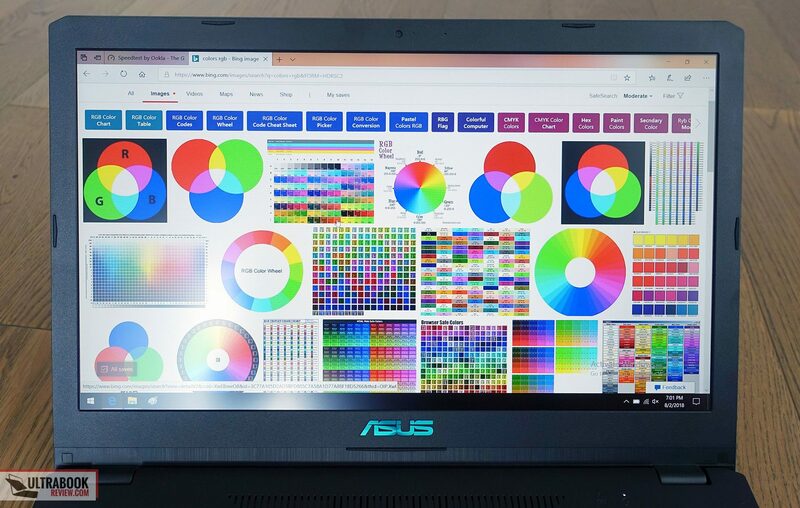 What the heck, Asus! I’am planing to buy this laptop for entery gaming (LOL, fortnite, overvatch) and everday surfing watching movies and similar things. In my country it comes with 2500U gtx 1050 4GB 256 SSD and 8GB of ram for 700€ is that a fair price or i could find something better for that price.